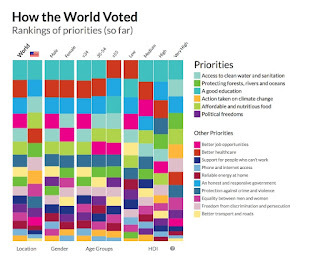 The UN is gathering worldwide opinions on what matters to us, the planet's citizens. 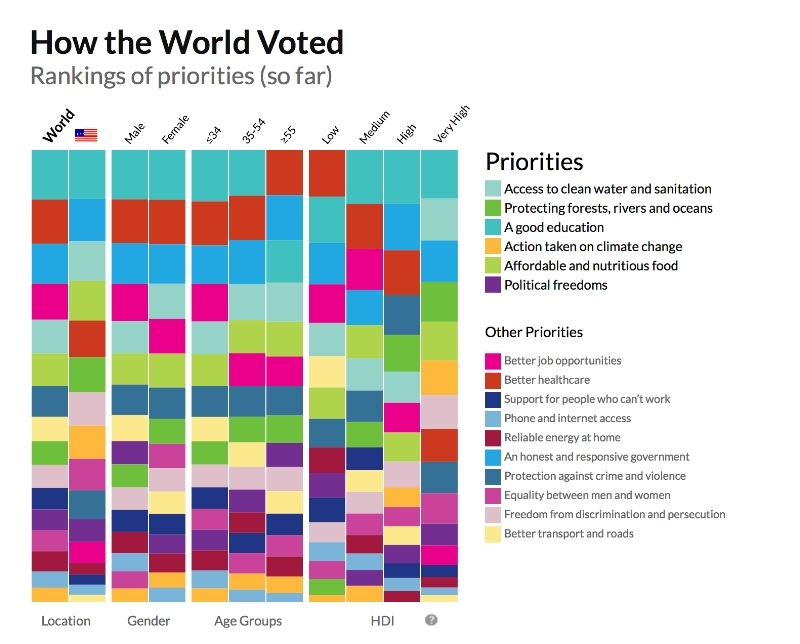 The survey, called MY World, "aims to capture people's voices, priorities and views, so that global leaders can be informed as they begin the process of defining the new development agenda for the world." The survey, which takes a few minutes to complete, allows you to choose six out of sixteen major priorities; once you're completed the survey you can see the current results displayed in a very nice interactive graphic that breaks down the responses according to gender, age, and HDI. A country's Human Development Index or HDI is a"summary index" that indicates the levels of health, education and income in that country. The results of the survey so far have a few trends that I find very interesting. It's still early days so the current results may be different from the final tally, but over half a million votes have been recorded, so the statistics are reasonable. First of all, there is a broad concensus about the top three priorities: "A good education", "Better healthcare", and "An honest and responsive government". Beyond the first three, priorities vary, as you would expect for the diverse worldwide collection of people. The priority put on "Equality between men and women", and "Freedom from discrimination and persecution", is higher in countries with higher HDI. Perhaps these things are are luxury items: something you worry about once the more basic needs are met. In low-HDI countries other things have higher priority, such as "Access to clean water", "Better job opportunities", and perhaps related to the latter, "Better transport and roads". Better transport and roads comes in at #6 of 16 for low-HDI countries, #10 for medium-HDI, #12 for high-HDI and #16 for countries with very high HDI. This just says that rich countries already have good infrastructure, while poor countries do not. Here is a cognitive disconnect: Globally, "Access to clean water and sanitation" ranks as #5 of 16, "Affordable and nutritious food" as #6, and "Protecting forests, rivers and oceans" as #9. All very worthy priorities, no? Then why is it that "Action taken on climate change" takes the back seat across the board, coming in at #16 of 16 globally? I mean, after "Phone and internet access"? Climate change acidifies oceans, dries up forests, and melts glaciers that feed rivers. Sea level rise would inundate large river deltas where a lot of the world's food is grown, and that are home to millions of people. Generally, climate change has dire consequences on agriculture. On top of that, between reduced flow in rivers, and the systematic depletion of aquifers (more irrigation is necessary as droughts become more severe), we're headed for a global water crisis. It is especially among respondents from low-HDI countries that climate change has the lowest priority (#16). But it's still only at #10 for high-HDI countries, and at #6 for very high HDI countries (#8 for the US). Even though it is citizens of low-HDI countries who are most at risk from the consequences of climate change. This may reflect a difference in time horizon: it's easier to think decades or a century ahead if you are secure in the knowledge that your food and water needs for today are met. For all of us on this planet, a stable climate should be the highest long-term priority; without that, most of the other priorities would be much harder to reach, certainly for our children. Somehow, we haven't put two and two together on that. It seems that all of us are right to put such a high priority on "A good education". Shared at Small Footprint Fridays and Simply Natural Saturdays. I did the survey, it was most interesting. Thanks so much for your analysis, that saved me a lot of time and effort! I see education and healthcare are at the top of the list. I did not know about this survey and as you say the results are bit sad on climate change and the environment. I really think the PR machine, at least in the US, has been so successful in casting doubt about the issue that it will have a long lasting effect. It seems Mother Earth is in dire need of her own PR machine, since the mainstream news is letting her down. I do believe that persistently putting out the right message will help stem the CO2 tide. It would be a worthwhile issue for large entities like the Gates Foundation to throw their weight behind.